Vancouver, British Columbia - Velocity Minerals Ltd. (TSXV: VLC) (“Velocity” or the “Company”) announces that it has received assay results for diamond drill hole RDD-040, which returned 144.7m grading 1.52g/t gold including 24.0m grading 4.05 g/t gold, at the new East Zone, Rozino gold project. Mineralization in drill hole RDD-040 is intersected from surface and is the thickest continuous drill intersection averaging greater than 1.0g/t gold ever returned from the property. The East Zone remains open for expansion with results pending from three additional step-outs. 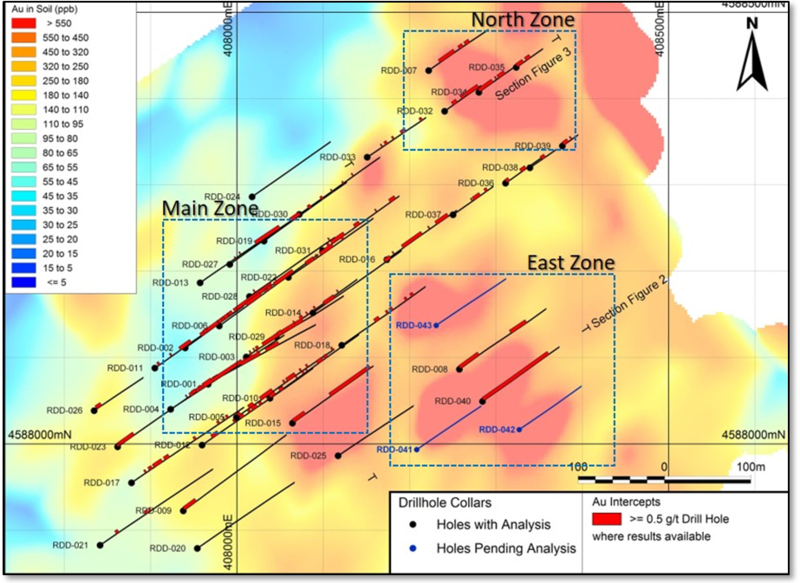 Assays from 17 drill holes were returned over the past month and results have expanded the extent of near-surface mineralization at both East Zone and North Zone (Figure 1). Figure 1: Velocity drilling to date at the Rozino project. Drill holes are shown on a soil geochemistry backdrop. Approximate limits for areas known as Main, North and East Zone are also shown. 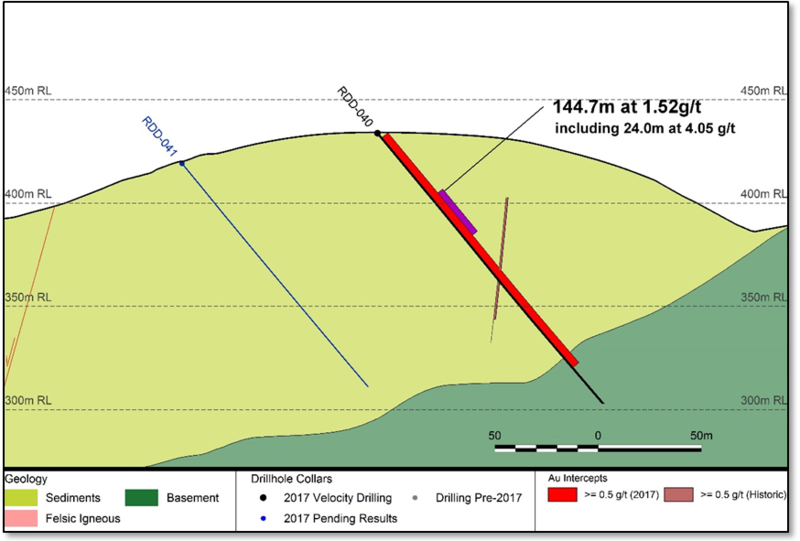 Drill hole RDD-040 is the first follow-up to the East Zone discovery, collaring approximately 50m to the southeast of discovery hole RDD-008, and intersected 144.7m grading 1.52g/t gold from surface (Figure 2). As with all mineralization at Rozino, thick mineralized intersections are defined by relatively consistent mineralization rather than by narrow zones of very high-grade material. This trend is apparent in RDD-040 where mineralization is continuous, with only 9 samples exceeding 5g/t and the peak assay is 14.05g/t gold (Figure 4). 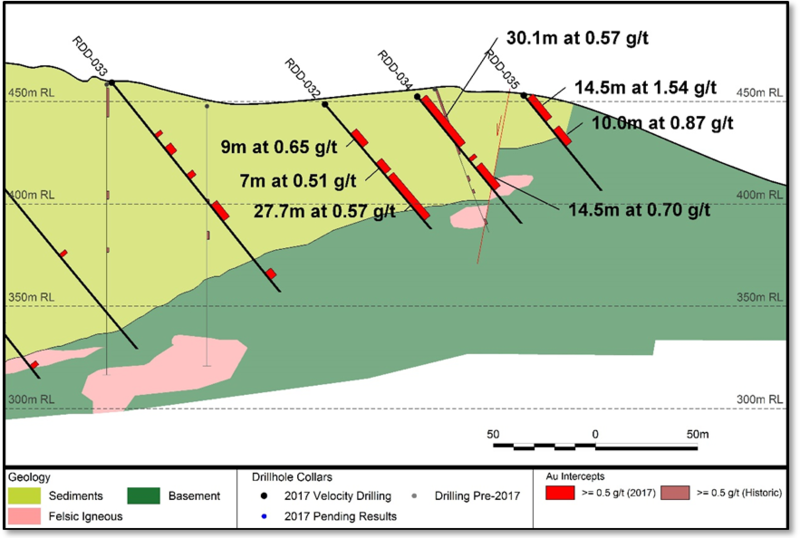 RDD-008 was Velocity’s first drill hole within East Zone (Figure 1), which intersected 41.7m from surface grading 0.86g/t gold and an additional 33.9m from 112.8m grading 0.79g/t gold. The original target was defined by a strong soil geochemical anomaly which extends over a 150m x 150m area. The zone remains open for expansion with results pending from three additional step-outs. Figure 2: Section showing drill intersection from drill hole RDD-040 located in East Zone. At North Zone, drill hole RDD-035 intersected 14.5m grading 1.54g/t gold from surface and from 22.3m an additional 10.0m grading 0.87g/t gold (Figure 3). Drill hole RDD-039 located 150m southeast of Velocity’s first drill hole at North Zone (RDD-007, 22.4m grading 0.8g/t gold) returned a 10.2m intersect from 3.3m grading 1.20g/t gold, including 3.1m grading 2.89g/t gold and the zone remains open for expansion. Figure 3: Section showing drill intersections from drill holes RDD-032 to RDD-035 located in North Zone. 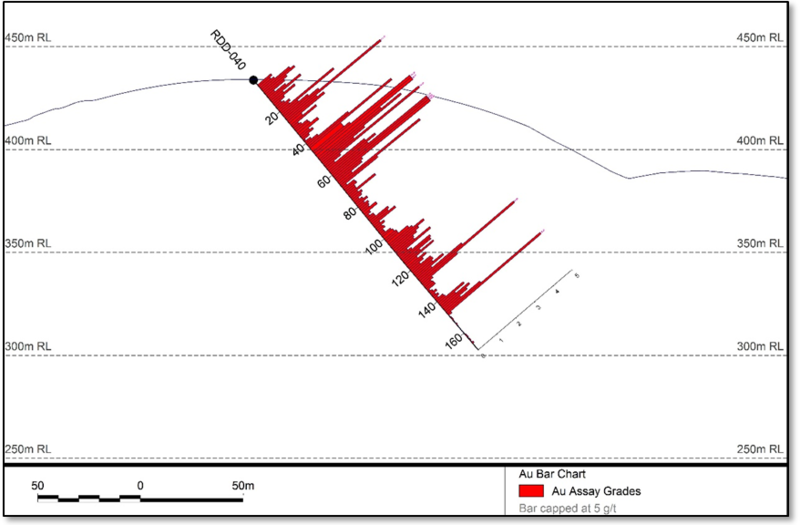 Figure 4: Assay bar chart showing continuity of mineralization in drill hole RDD-040. The current exploration model has not had sufficient drill testing to be able to determine true thickness of mineralization. Updated drill plans and cross sections have been uploaded to the Velocity web site together with a full table of gold intersections. Local knowledge and experience are essential components of mining investment in a foreign jurisdiction. Velocity Minerals has entered into a number of option agreements with Gorubso Kardzhali A.D. ("Gorubso'), an established and respected mining company in Bulgaria. Gorubso operates the underground Chala Gold Mine (2006) and the Kardzhali Carbon In Leach (CIL) processing plant (2011), which produces gold dore. Gorubso is the first and only company in Bulgaria to have secured a permit for cyanide-related processing of gold ores. Velocity’s management has a long-standing relationship with Gorubso as well as significant previous experience in Bulgaria and elsewhere in the region.